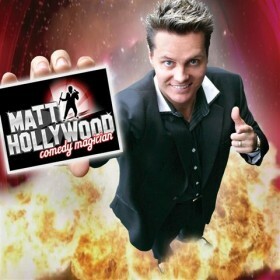 have 50 people or 500 people attending your next event, one thing is for sure – your guests will not forget the amazing magic of the Matt Hollywood Magic Show. Matt has been featured amongst the best of The Footy Show comedians and is regularly featured on numerous television shows including Mornings with Kerri-Anne, Big Brother Uplate, Ready Steady Cook, The Shak, The Big Night In, Toasted TV and many more. For the past 10 years, he has entertained companies and individuals across the globe with his hilarious mind-blowing magic and Las Vegas style illusions. After winning numerous National and International awards for his skills including the coveted Australia’s ‘Champion of Magic’, his brilliant sense of humour set a new standard for entertainment. You are GUARANTEED ‘hilariously impressive and unforgettable performances’. This very special kind of personalised entertainment is guaranteed to win the hearts of all your guests giving them a night they will remember always.